Ready to use cleaning liquid. For brilliant streak free cleaning. Based on 99% natural raw materials. For hard floors and parquett.Floor cleaner for Vileda 1,2 Spray System. 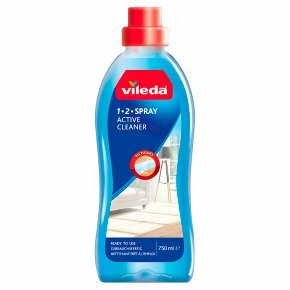 Usage instructions: Active cleaner for Vileda floor mops with spray handle (1-2 Spray range). Fill the handle from the top until Max. level. Ready to use liquid, do not mix with water or other cleaners. Not suitable for unfinished, oil finished, wax finished or painted wood floors. For Laminate and Parquet refer to the instructions of floor manufacturers. In case of doubt try first on an inconspicuous part of the floor.